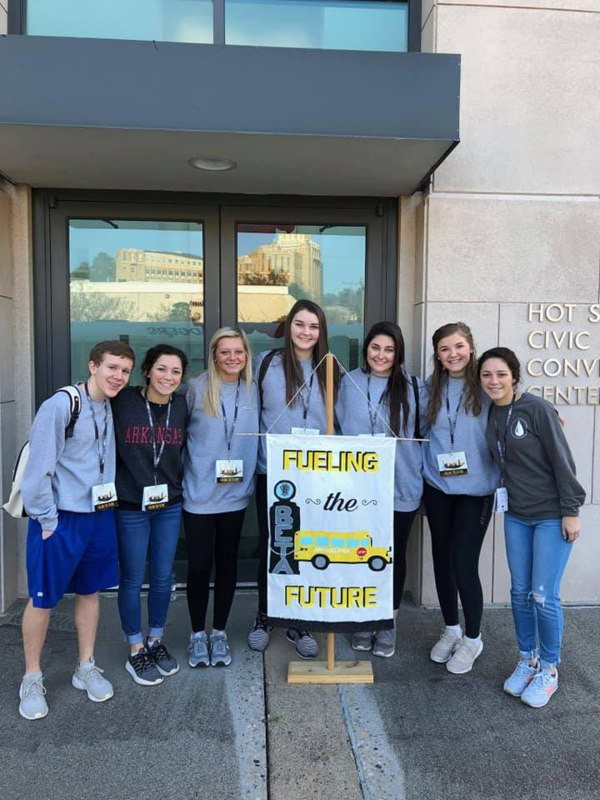 Twenty-two Arkadelphia High School Beta Club members attended the 77th Annual Arkansas State Beta Club Convention in January at the Hot Springs Convention Center. Students competed in Visual Arts 2-D, Painting, Photography, On-site drawing, Spanish, Language Arts, Science, Mathematics, Quiz Bowl, and Technology. AHS Beta Club is new to the convention scene as this marks only the second year of full participation in event competition. Junior Sawyer Goodrum created a video based on the topic "Today’s Leaders, Tomorrow’s Future" for the technology competition. Goodrum was unable to attend the state conference due to personal scheduling conflicts, senior club member Henry Hunley and junior club member Cabb Batson presented the video. The team won 5th place and are eligible to participate in the National Beta Club convention in Oklahoma City, OK in June of this year. Students raised money to attend the convention by selling raffle tickets for a $100 Exxon gas card donated by Mr. Randy Dixon of Arkadelphia. AHS chemistry teacher Tanya Ruble and AHS English teacher Michaela Harness are the AHS Beta Club sponsors. Earlier in the school year, the AHS Beta Club Chapter was named a Beta National Club of Distinction. The National Beta club is the largest independent, non-profit educational youth organization in America. For more than 80 years it has prepared today’s students to be tomorrow’s leaders. The mission of the Beta Club is to promote the ideals of academic achievement, character, service and leadership among elementary and secondary students.